In Volanakis’ painting in the A. G. Leventis Gallery, iconographical and stylistic elements encountered in other of his well-known works are successfully combined, including the motif of children seated on the beach in the foreground and the boat pulled out on the beach in the middle-ground. 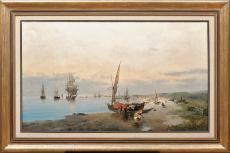 The calm and serene mood of the scene, with the sailboats in the background, the quiet water of the sheltered beach, the light reflections, the mild contour of the ground, the clear atmosphere and the diffuse light place this painting amongst the idyllic seascapes by Volanakis, who is regarded as a great advocate of the Mediterranean and Greek sea and shore landscape. After graduating from high school on Syros, he found himself in Trieste, in 1856; there he worked as an accountant in the trading house of his brother-in-law, Georgios Afentoulis. In 1864 he went to Munich to study at the Academy of Fine Arts. In 1867, the receipt of the first prizein the international art competition for the naval battle of Lissa, organised by the Emperor Franz Joseph II of Austria, made him famous and enabled him to travel for two years on the shores of the Adriatic Sea on board ships of the Austrian fleet in order to familiarise himself with the place where the events took place. In 1883 he settled in Piraeus and became a professor at the Athens School of Arts, where he taught until 1903; concurrently, he taught at the art centre he had established in Piraeus in 1895. He received the Silver Cross of the Saviour in 1889. The works by the supreme Greek seascapist of the 19th century, inspired by life at sea, convey his intimate knowledge of types of, mainly Dutch, painting; they stand out for their love of lyricism and ambiance, and the artist’s skill in capturing detail. In his evocations of naval conflicts, he followed more academic precepts, while his landscapes betray the influences of painting en plein air and Impressionism.